Okay, I realise the previous post talks about getting rid of stuff…. but I couldn’t help myself! Heres todays job lot, bought from a house clearance business near Burnley. 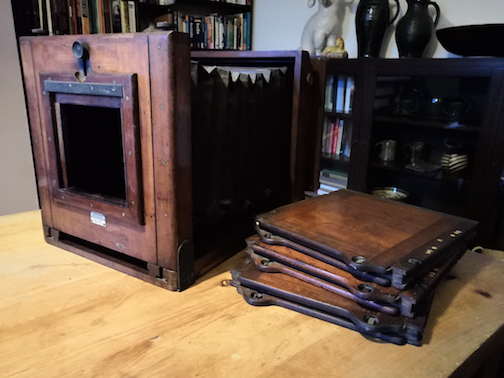 They had been on ebay for too much money, then they were reduced to an okay price, so I took a gamble hoping the bigger camera was a 12×15 inch tailboard. When I arrived at the lockup, he handed me the first batch of plate holders, whole plate and 10×12 inch, I felt a little deflated but then the next batch he handed me were much bigger, and then the camera appeared and I gave myself an imaginary high five, it was definitely bigger than 10×12. They were filthy and it took three of us to carry it all the the van. On getting home I give it all a quick looking over and a good vacuum and a clean/polish. 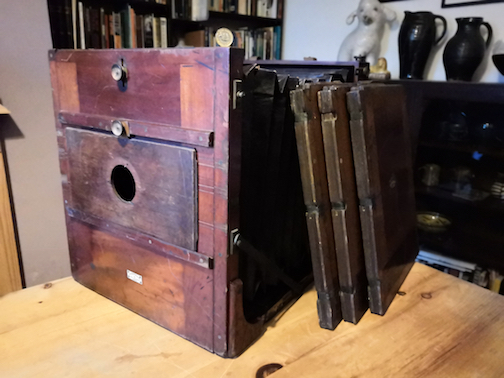 So, heres a Houghton and Sons 12×15 inch Tailboard camera with three plate holders… The bellows need taping and a fine focus crank handle is missing but its still very useable. I’m tempted to get rid of the Hunter Penrose and use this instead as I’ve never stepped up further than 12×15 inch, I think 12×15 is big enough for a contact print. A Meagher Whole plate studio camera with three plate holders. This is a lovely camera but the bellows need a lot of taping. Someone has first dibs on this (you know who you are) but I might keep it if they dont want it. EDIT: looking at this camera again this morning and thinking to myself that its a big lump of a thing, so I thought I’d check and measure it properly. Turns out its 10×8 inch plates and not whole plate!! There was also an assortment of three 10×12, and two whole plate holders. 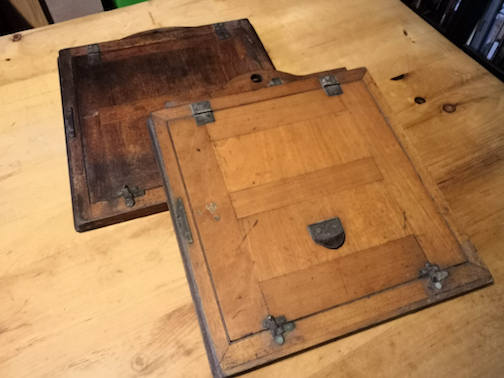 And also these unusual single plate 12 inch square holders. I would have loved to see what camera these came off. I’ll be selling on the 10×12 and these two if anyones interested. So all in all, well worth the gamble. 01 Dec This entry was written by Fourtoes, posted on December 1, 2018 at 4:15 PM, filed under Misc..